Brothers Gonna Work It Out is a compilation album by English big beat duo The Chemical Brothers, containing various artists' work mixed by the duo. It was released on 22 September 1998. The cover features a picture of Our Lady of Fatima church in Harlow, Essex, England (http://goo.gl/maps/N9Yig). 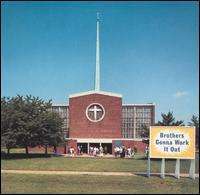 The quote "the brother's gonna work it out" comes from a track by Willie Hutch and is also featured in the duo's earlier track "Leave Home". It peaked at number 95 on the Billboard 200 chart. Willie Hutch – "Brothers Gonna Work It Out"
The Chemical Brothers with Justin Warfield – "Not Another Drugstore (Planet Nine Mix)"
The Chemical Brothers – "Block Rockin' Beats (The Micronauts Mix)"
On the House – "This Ain't Chicago"
The Jimmy Castor Bunch – "It's Just Begun"
Kenny Dope presents The Powerhouse Three – "Makin' a Living"
Badder Than Evil – "Hot Wheels (The Chase)"
Unique 3 – "The Theme (Unique Mix)"
Love Corporation – "Gimme Some Love"
The Micronauts – "The Jazz"
The Serotonin Project – "Sidewinder (312 vs 216 Stomp Mix)"
Carlos "After Dark" Berrios – "Doin' It After Dark (D-Ski's Dance)"
Freestyle – "Don't Stop the Rock"
Metro L.A. – "To a Nation Rockin'"
The Chemical Brothers – "Morning Lemon"
Meat Beat Manifesto – "Mars Needs Women"
Dubtribe Sound System – "Mother Earth"
Barry De Vorzon and Perry Botkin, Jr. – "The Riot"
The Ultraviolet Catastrophe – "Trip Harder"
Manic Street Preachers – "Everything Must Go (Chemical Brothers Remix)"
Spiritualized – "I Think I'm in Love (Chemical Brothers Vocal Remix)"
1 2 3 4 Stephen Thomas Erlewine. "Brothers Gonna Work It Out - The Chemical Brothers". Allmusic. Retrieved 5 October 2011. ↑ "Brothers Gonna Work It Out – The Chemical Brothers | Awards | AllMusic". AllMusic. Retrieved 21 April 2015.